TAMPA, FLORIDA, USA, November 7, 2018 /EINPresswire.com/ -- On October 30th, in recognition of Red Ribbon Week (October 23-31), the Florida chapter of the Foundation for a Drug-Free World (FDFW) held a family-friendly educational event and costume party, "Drugs are Scary". 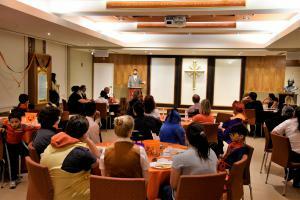 The event was hosted at the Church of Scientology of Tampa in Ybor Square. Speakers included: MC Joanna Young from the Foundation for a Drug-Free World; Emergency Management Technician Shannon Barnes and the Public Secretary for Narconon Suncoast Drug Rehabilitation Center. Calling attention to the tragedies that have been brought about through drug addiction and the illegal drug trade, the event also explored effective measures to achieve a drug-free world, in line with the foundation's mission to eradicate drug abuse through education.